Fee's Little Craft Studio: Moda Bakeshop Items - WIN !!!! Want to win some fabric? Pop on over here to see Camille - She gives a great explanation of Moda packs and tells you what to expect in every pack. You can tell by her descriptive words how much she loves Moda packs as do I. While you are at it go to the Moda site and see the ranges that they are about to release in the next 2 months I have fallen in love with Sorbet and am now off to see if I can pre-order it somehwere. I am going to my best friend's daughters wedding this afternoon of which I have arranged. (I manage a function centre) so I had a lot of fun with this one - I was asked numerous times if it was my wedding :)) I chose the colours for the reception etc and will post pics tomorrow. Until then have a happy day stitching, gardening or just relaxing. PS. 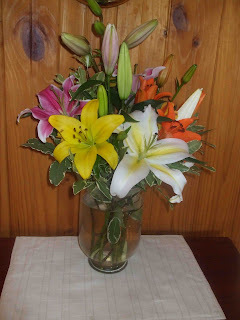 These are the flowers that the bride gave me yesterday - My house smells glorious. I think Jelly Rolls are just the cutest...have purchased one this year and hope to start something after my course...looking forward to the pics...hope it all went really well!!! And love your new look by the way!!! I hope you have (had) a lovely day at the wedding. I look forward to seeing your shop set up and wish you the best of luck with it.